This electric pressure washer is a satisfying tool. Plug it in, hook up the hose, and you are ready to clean anything in sight outside – siding, car, RV, driveway, patio, deck, fence, and pretty much anything else man-made you can find. The average homeowner is thrilled to have this tool around and both contractors and car detailers are surprised to find themselves happy with it, too. Most people talk about how they used to use a gas model and nearly every one of them wishes they’d made the switch sooner. The Sun Joe SPX 3001 has all the power and ability of a gas washer without having to deal with the hassle, the stink, the noise, and the touchiness of gas engines. Sun Joe has only been around since 2004, but they’ve committed to developing and selling electric-only tools as well as providing old-fashioned customer service by real humans from their New Jersey offices. The Sun Joe SPX 3001 is shockingly effective at blasting years of dirt and grime off anything you aim it at. It doesn’t have the highest PSI you’ll find in the world of pressure washers, but it’s still plenty to take care of anything you want around the house. The array of included nozzles means you’ll always have the right one on hand for any job. Whether you need to clean siding, fencing, driveway, walkway, cars, or anything else outside your front door, this is more than enough machine to get it done. The internet is littered with before and after photos posted by exuberant users. Sun Joe has thought of everything. Don’t worry about losing the five nozzles they include – there’s a place to put each one of them on the machine. 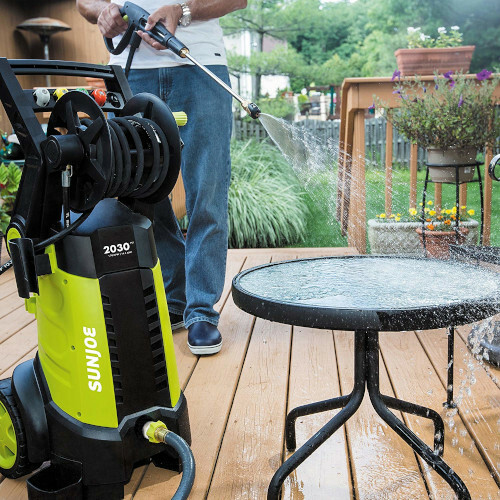 Don’t worry about wrangling the hose – there’s a reel on which you can wind it. Don’t worry about moving it around – it’s soundly constructed, lightweight, and on wheels. Don’t worry about starting it – plug in the electrical cord and attach the hose and you’re ready to go to work. Your great-grandmother could operate this tool – Sun Joe has paid attention to the details and designed an intuitive machine. Every tool manufacturer sends lemons out into the world but not all of them do much to remedy that. In addition to providing customers with solutions tailored to their specific issue, what’s also noteworthy about Sun Joe is that it appears to actively be looking through online reviews to identify unhappy users and then reaching out to them to offer assistance. Not every company is this proactive about problem management. We love that this unit comes with a hose reel, but if we could change one thing, we’d make that feature work better. Some users are quite happy with it, but there are plenty of others who find it stiff and unwieldy – they wind up turning the crank handle to unwind more hose because if you try to pull it off while you’re in the middle of working, the machine tips over without releasing additional hose. Can I use an extension hose with this to increase my range? Yes, and Sun Joe sells compatible hoses for exactly this reason. But you won’t be able to wind the extra hose onto the onboard hose reel – you’ll have to disconnect the extension and store it separately. Can I use it with a foam cannon to wash my car? Yes. This is a popular use of this tool. Do I need to do anything special to winterize this pressure washer? If you live somewhere that sees freezing winter temperatures, definitely. Drain out all the water, towel off the nozzles, and store it indoors during the winter. Can I control the amount of water pressure being used? The pressure from the machine is constant, but the different-sized nozzles will “change” the pressure of the water. The widest nozzle will be more of a spray and the narrowest will be more like a narrow stream. 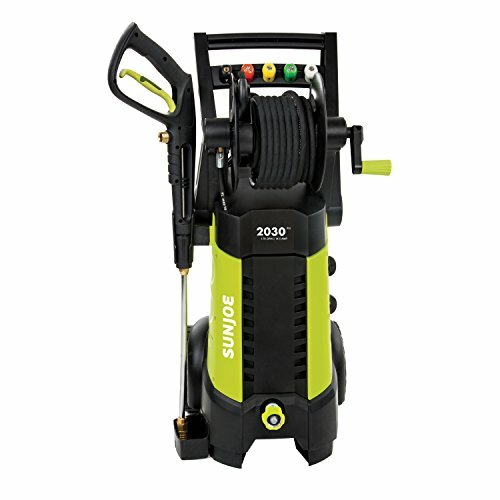 Reviewers can’t use enough over-the-top language to describe how much they like this Sun Joe pressure washer. They absolutely rave about how amazingly effective it is at removing built-up mildew, dirt, mud, and general grime of unknown origins no matter where they find it. People are shocked – with no idea how dirty their fence/siding/whatever actually was, they are beside themselves with glee once they’ve cleaned it. Users will go outside to use this for the first time to wash one thing and spend the rest of their weekend cleaning everything and anything because . . . it’s fun! Do some struggle to get their hoses to attach securely? Yes. Do some see leaking at the couplings? Yes. But with a few minutes of tinkering, they are usually back up and running and cleaning like banshees. 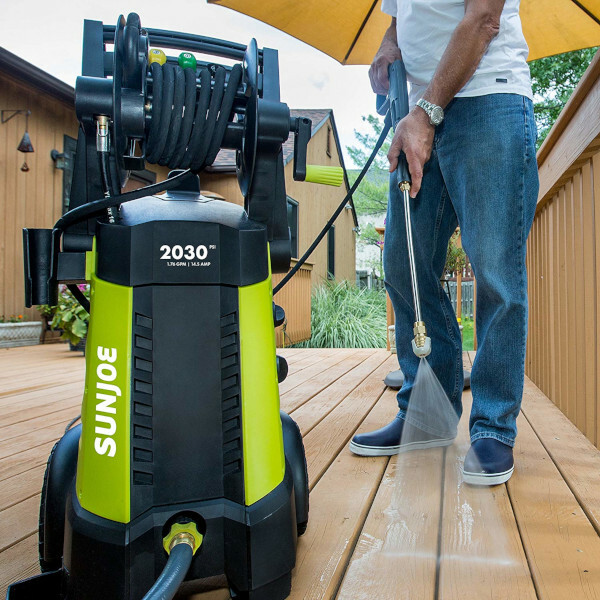 The Sun Joe SPX 3001 Electric Pressure Washer is a terrific addition to any homeowner’s garage of tools. You’ll be actively looking for new cleaning projects because this is just so satisfying. You might even wind up asking your neighbors if you can clean some of their stuff, too. Don’t like your neighbors? Then that might be the only reason not to go ahead and grab one of these.